After the crazy over the top colourful explosion of my woven stitch Beyond TAST sampler, I decided to go the complete opposite way for my “threaded and laced stitches” sampler and use just two threads and as few colours as possible overall. Inspired by a line drawing I found online (which I unfortunately can’t find, sorry), I decided what I wanted to investigate how to use threaded and laced stitches to create different qualities of sketches lines. First I stitched a vintage handkerchief that I had dyed navy blue onto a piece of blue striped cotton. Whenever I use a dark cotton or linen background for a pre-drawn embroidery, I transfer the image using yellow or white dressmaker’s carbon paper. If the design isn’t super detailed, it will usually last long enough to get most of the details done as long as it’s not handled too much. Next I took some of my dyed blanketing, cut out the flower and leaf shapes and stitched them down with silk thread. I like to use silk thread whenever I want the stitches to disappear into the ‘felt’ (as I tend to call the boiled wool blanket). The thickest lines are pekinese stitch worked over a base of chain stitch instead of back stitch. I was surprised at how well it worked going around curves. I think this was my favourite discovery in this sampler. The line is nice and thick and bold, without being fussy to stitch. The medium lines, such as the circle in the centre of the square mustard flower are whipped chain. 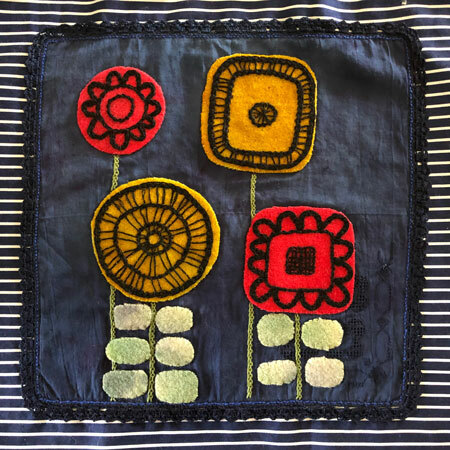 The finer lines, such as the round mustard flower are three strands of floss threaded through the stitches that form the circles. 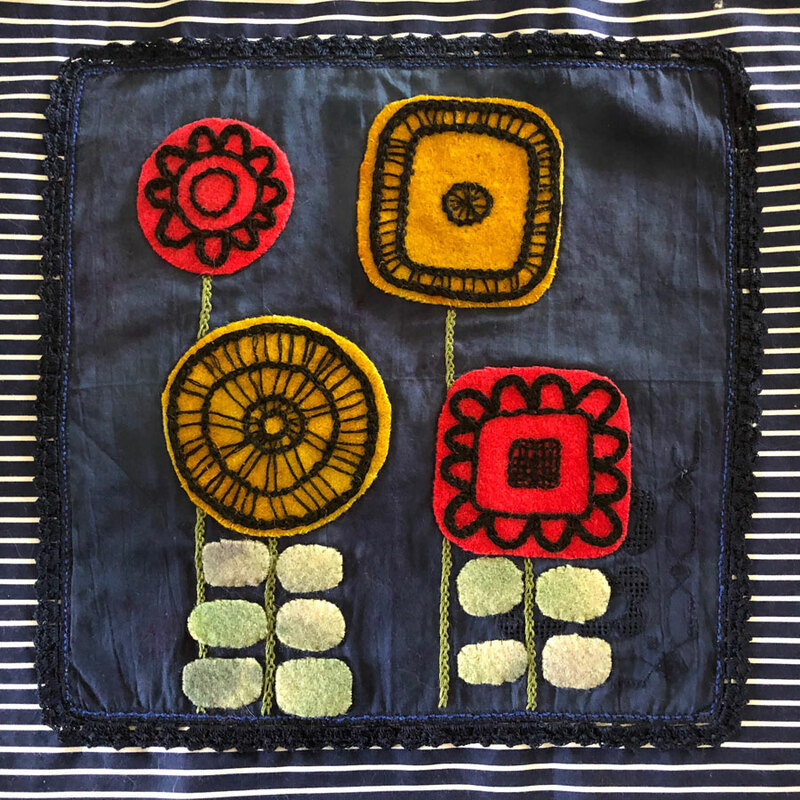 The checked square in the square red flower is worked with two strands of floss, and the second layer is woven through the first. Finally, the stems are pekinese stitch. I’m definitely going to work this way again, but I’ll try and add a bit more depth to the colours I’ve used in the background. I feel this is a little too dark overall. Perhaps next time I might try stitching just white on the navy blue and see how that turns out.